The result of many years’ experience and cooperation with turbo workshops is the compact core assembly high speed balancing machine characterized by high accuracy and efficiency. CMT – 48 twin combines two machines in one housing. The unit on the left side is CMT – 48 VSR for high speed balancing of turbocharger core assemblies for passenger cars. The unit on the right side is CMT – 48 tr for balancing turbocharger core assemblies of trucks and vans. It is also possible to check the core assembly for oil leakage. This solution enables you to balance core assemblies of turbochargers of passenger cars, vans and trucks with the use of only one machine. The advanced measuring unit ROTORTEST 610 is equipped with 17″ LCD industrial touch screen for balancing results presentation and has installed sophisticated software which makes machine operation easier than ever before. The measuring unit enables to save data on external storage via USB port, send it via Wi-Fi or Ethernet and print the balancing reports out with built-in laser printer. CMT – 48 TR is applied in the second stage of turbine recondition process. 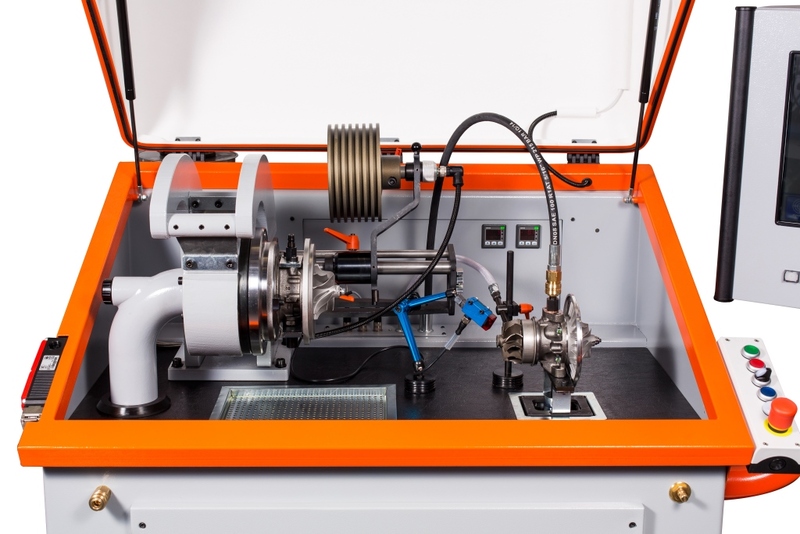 The machine has been designed to dynamic balancing of all kinds of turbocharger core assemblies, especially vans and trucks, in two correction planes. It is also possible to check turbine for oil leakage. Balancing conditions are similar to those of combustion engine. The core assembly is provided with the oil of the proper temperature and pressure. The oil is subjected to continuous filtration processes. Rotational speed of core assembly is set by manually adjustable air flow. The range of achievable rotational speed is between 10.000 – 40.000 rpm. CMT – 48 VSR has been especially designed to high speed turbochargers of passenger cars and vans. The machine is used for checking is there any unwanted dynamic phenomenon of the rotor at service speed of the turbine i.e. flexural of rotor by moment of force. Balancing process is performed by comparison of selected parameters of vibrations to values specified by turbocharger manufacturers as boundary values of these parameters. Software suggests the position and amount of correction mass to be removed. The core assembly is installed in the machine to the universal socket by the use of the proper adapters. Journal bearings of the core are supplied with the oil of the proper temperature and pressure. The oil is subjected to continuous filtration processes. The core assembly acceleration is done by the use of compressed air (8 bar). 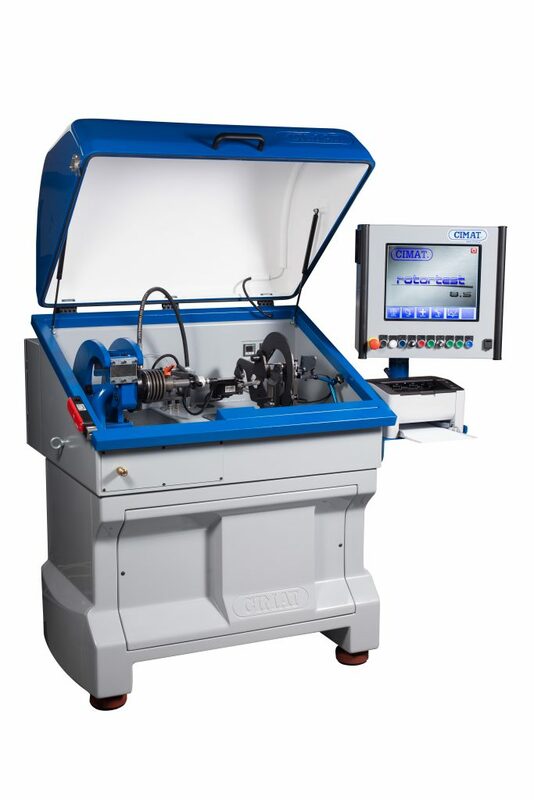 It enables to achieve rotor velocity up to 280.000 rpm. Measurement process lasts just for approximately four seconds. As a result of measuring process, graph of vibration characteristics is displayed. Moreover, the software indicates the exact angular position of imbalance and its amount. There is no need of machine calibration before balancing process. Balancing conditions are similar to those of combustion engine. CIMAT has developed an innovative solution in regards to the adapters for VSR machines which enables you to make significant savings in your company budget during future exploitation of the machine. 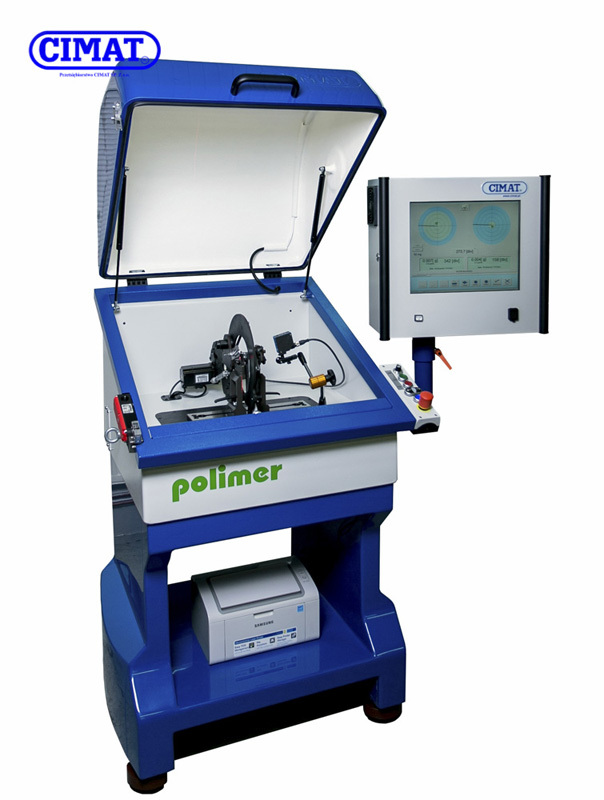 This system has been patented and is only available with CIMAT VSR machines. Contact us for more details. Balancing speed up to 280.000 rpm. Min. achievable residual imbalance 0,005 gmm. Measurement run takes no longer than 4 seconds. Software indicates the exact angular position of imbalance and its amount. Construction of the drive system enables to have an access to turbine wheel without uninstalling the core which makes work faster, easier and more efficient. Having CIMAT’s VSR machine with its innovative, universal adapters with the fewer number of them you can install and balance more cores than with the adapters of other manufacturer. This solution enables you to make significant savings in your company budget during future exploitation of the machine. By application of CIMAT’s innovative adapters the amount of air needed for core acceleration is considerable lesser in comparison to amount of air needed in the machines of other manufacturers (300 l per measurement run). Installation of the core is very fast. Mass correction process without uninstalling the core assembly. Safety guard with CE Mark. Intuitive software allows you to manage in an easy way earlier saved data of your customer’s turbochargers.